Check out what's on at Bargo Sports! Join us on Facebook and keep up to date with whats news and what's on. From Management and Staff of Bargo Sports Club. Pennants competition is a state based competition, each club has 3 x teams of 4 players. On the way to the finals we first had to win the Zone 5 Pennants competition and beat clubs from as far and wide as Crookwell to Wentworth Falls (Zone 5 = Greater Western Sydney). This year the zone 5 competition consisted of 15 different teams, and it should also be noted there are 16 different zones throughout NSW …… so to be the winner of the state final means that you are the #1 club amongst many many other clubs throughout the entire state. The finals were held at Fingal Bay Bowling Club and Soldiers Point Bowling Club. Sectional play was held on Friday and Saturday at Fingal Bay, we went down on our first game against Wiseman Park Wollongong City on the Friday afternoon, but got up against South Lismore in the morning and then Northmead in the afternoon on the Saturday. This was enough to win us our sectional play, and make our way to the finals. 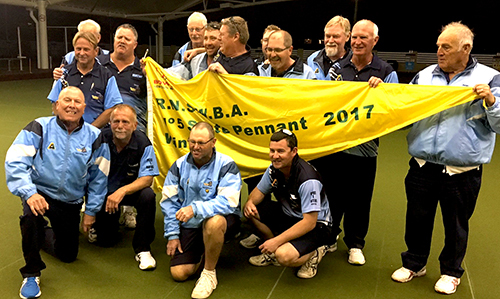 ….. it was a super close match, and an absolute fantastic game of bowls, in front of around 150 spectators and supporters ….. and thanks go to those who travelled from Bargo to support us not only in these state finals but throughout the entire year. This is the pinnacle of lawn bowls and something every player strives for ……. Like a grand final victory in the NRL, this is something that the majority of lawn bowlers will never achieve throughout their entire lifetime. The team played extremely well throughout the entire season and got a very well deserved result for a bunch of players who combined as a true TEAM. Not only was the quality of bowls fantastic throughout the entire season, the way these men represented their club and their zone both in their bowls and their attitude was something we are very proud of.